Community College Success: New video series! I am so excited to announce this new 20-video student success series filmed for the P.S. Blog! The videos will release every week for the rest of the Spring semester and then pick up again in the Fall. 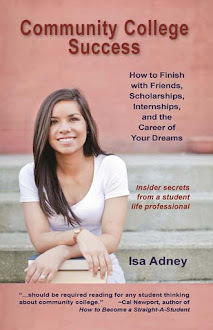 They all feature quick tips to help you Break Through to success in your college life. There are also a few surprises in each video to keep things fun. This week's video features tips to help you start networking for success in college. Is grad school right for you?